For those of you who have always wanted to wear Emerald Chronometer on your wrist (and really, who of us hasn’t ), now you can! We’ve just completed a long effort to port Emerald Chronometer to Wear OS by Google (this is Google’s watch OS, which used to be called Android Wear). 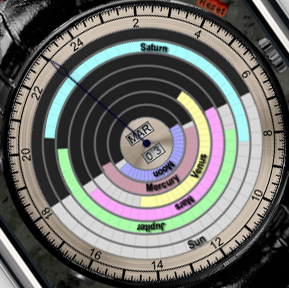 It’s available as a package of 21 watch faces (a subset of those available in our iOS products, plus a couple of new ones special to Wear OS). To use it, you’ll need a watch running Android Wear 2.0 or greater (or, as it’s now called, Wear OS 1.0 or greater). This doesn’t include the Apple Watch, unfortunately, but there are a number of watches available. See our mini-FAQ below. You can read all about the new app here. Thanks again for all of your support and kind words over the years! 1. Why not the Apple Watch? Apple does not allow developers to create custom watch faces. 2. 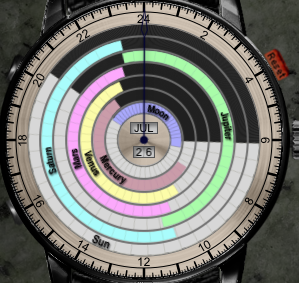 Which faces from iOS are missing on Wear OS? 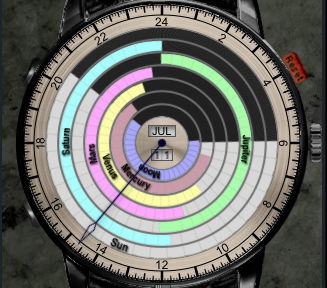 The three timing faces (Istanbul, Olympia, and Thebes) are currently not implemented for Wear OS. Also, Atlantis has changed considerably (we think for the better). 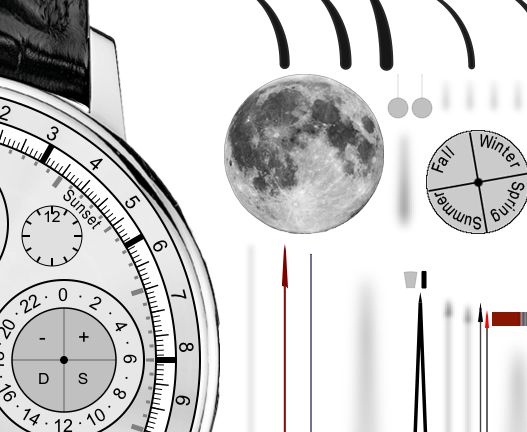 Note also that the faces that appear on the “back” in iOS are separate faces in Wear OS; for example, the iOS “watch” called Geneva is two faces in Wear OS, Emerald Geneva (the front) and Emerald Basel (the back). 3. Which watch do you recommend? 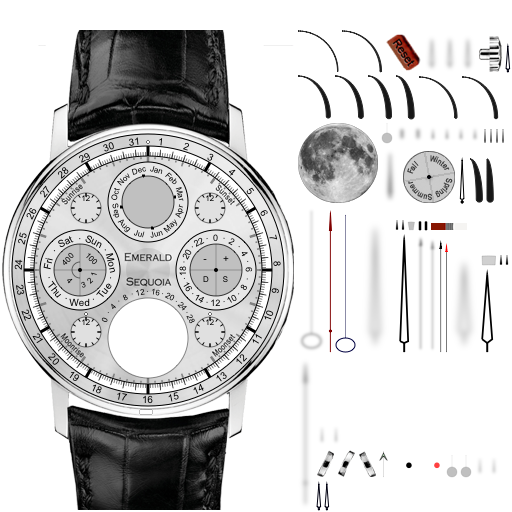 We can’t really recommend a specific watch, since we haven’t personally tested most of them. That said, we recommend seeking out a model, running Wear OS 1.0 or greater, with a long battery life (not because of our app, which is very efficient with energy, but to make sure you have a good experience overall). Our best personal experience has been with the Fossil Q Gen 3 Explorist, but as we say, we haven’t tested very many of them ourselves. 4. I’ve bought a watch and have more questions! As always, please see our full FAQ (the one for Wear OS is at http://emeraldsequoia.com/aw/ecsupport.html) and then email us if you have trouble. Version 3.8 of Emerald Chronometer HD has just been approved for the App Store, and fully supports the new iPad’s Retina display. Just as with support for the iPhone 4’s Retina display, adding this support required new artwork at double the resolution in each dimension, for a total of 4 times the pixels of the prior ECHD version. We hope you enjoy it! As before, we sympathize with those of you on slow connections, but we used the same logic as before and decided we wanted this to be a free upgrade for ECHD users, which meant all ECHD users needed to upgrade. 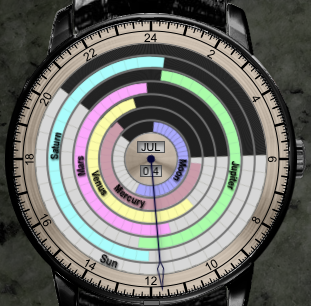 We’ve just added our 16th watch to Emerald Chronometer and Emerald Chronometer HD: “Babylon” is a full-month calendar watch, with an unusual mechanism. The mechanism (which is one of our most complicated “mechanically”) consists of three stacked wheels and a series of covers that slide in and out. You can read more about it here. It’s the longest and deepest lunar eclipse of the decade, but unfortunately most of our customers will miss it because the moon will be below the horizon. You’ll be able to see a bit of the ends in Europe and Australia, but only India and eastern Africa (and a bit of central Asia) will get the whole show. You can still see the effects in Emerald Observatory and Emerald Chronometer/Emerald Geneva (the back of the Geneva watch has an eclipse indicator dial), even if the eclipse isn’t visible at your location. We’ve gotten a lot of requests for this, and we’ve finally put it in the can: We’ve just hit the App Store with an iPad version of Emerald Chronometer, called “Emerald Chronometer HD”. You can see the press release here, some images here, and the App Store page here. Once again this was more work than you might think, because of the way the app works with its OpenGL implementation. Something as simple as rotation, which is trivial on a simple app with standard UIKit views, becomes a lot more complicated when you have an OpenGL view and UIKit views and you want to animate it all smoothly during an orientation change. Watch carefully what happens when you rotate the device while grid mode is up; that represents a week of development effort. 🙂 We did get to make use of the higher-resolution images we developed for the Retina display, however. Anyway, we’re pretty happy with the way it looks, in both portrait and landscape modes. And in grid mode with 2-4 watches, all of the watches are the same size as they are in Emerald Chronometer on the iPhone (or larger), so it’s a nice way to see more than one watch at once and still be able to read each one. 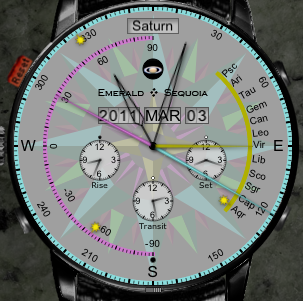 The new app is priced at USD $5, the same price as Emerald Chronometer has been since it entered the store. At the same time, we are reducing the price of Emerald Chronometer to USD $2; this reflects both an overall downward trend in app pricing in the past three years and also the additional value (and development effort) associated with the iPad app. We hope you like the new app! There will be a lunar eclipse later this month, visible in the Americas (a total eclipse, around midnight on the night of Dec 20-21, weather willing) and parts of Australia (partial eclipse just after sunset on the 21st) and Great Britain (partial eclipse just before sunrise on the 21st). The outer ring shows things that are apparently rotating around the Earth, namely the Sun, the Moon, the shadow of the Earth, and the nodal points of the lunar orbit, which are the points where it intersects the apparent orbit of the Sun. When the Moon and the Sun are at the same point on the display’s ring, there is a new moon. A new moon does not always result in an eclipse, but if the new moon happens near a “nodal point” (red line on the ring), it means the orbital paths of the Sun and Moon are close to intersecting and a solar eclipse is possible. Similarly, when the Moon is opposite the Sun on the ring, it will be at the same point as the Earth shadow (black-filled circle) on the ring display, and there is a full moon. Again, a lunar eclipse does not always occur when there is a full moon, but again if the full moon happens near a nodal point (red line), then a lunar eclipse is possible. As I said earlier, we removed the leap-year indicator. 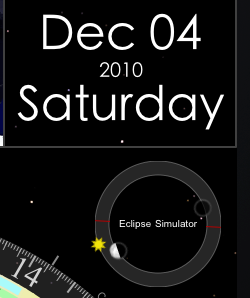 We moved the year itself next to the date (as shown in the top picture), and have a simple “Leap” indicator that turns on when there is a leap year, but the complex 1/2/3/4/100/400 display is gone. We were somewhat ambivalent about it from the start anyway, and at least one observer agreed. You’ll need version 1.3 of Emerald Observatory to see it. It was approved for the store last night and should show up in the next 24 hours. The new iPhone 4 support that Bill just posted about required a whole new set of artwork, which is why it took so long for us to get this support out. Most simple apps simply use built-in widgets and graphic routines to render their displays, and those apps got Retina support simply by recompiling. (Our own apps Emerald Time and Emerald Timestamp fall into that category, and we supported the Retina display in those apps when the iPhone 4 came out). 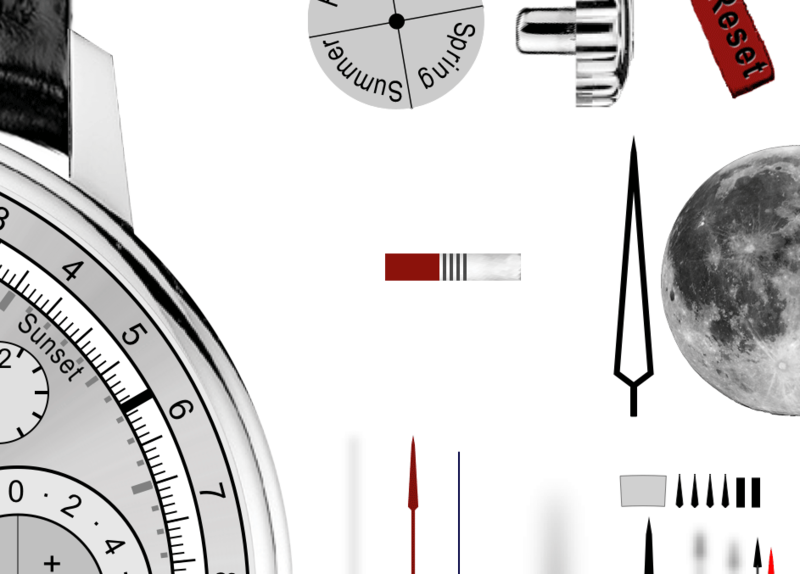 But the displays you see in Emerald Chronometer are rendered using a “parts list” of display objects that is generated with a custom external tool. That image, and many more like it, are included with every copy of the app we ship. 1) Creating a separate app with the high-resolution artwork in it, and leaving the existing app as is. This would have removed any impact on owners of 3GS and earlier devices. But we didn’t think this was fair to our existing iPhone 4 customers, since they would have to pay full price for the new app for a relatively minor feature upgrade, and we didn’t see any other app developers do this. 2) Making an in-app purchase option for $1 to get the higher resolution artwork. At first this seemed like a good idea (especially since it would bring in a small amount of revenue for our not inconsiderable effort generating the new artwork), and we spent a little time developing some store infrastructure to support it. But this would mean that users would have to download the additional 35 megabytes or so of Retina-specific imagery while running the app. This maybe wouldn’t be so bad, but the artwork typically changes in minor ways every time we release a new version, so it would mean that going forward as more and more people had iPhone4-class devices, we’d all be forced to do this extra step every time a new version was released. We finally decided that the right long-term architecture was to just support the Retina display as part of the normal app. Anyway we hope those of you with Retina displays like it. OK, first feedback question: What’s your favorite watch in Emerald Chronometer? Submit your answer via the comments (click on the Comments link to the upper right of this post; you’ll have to register the first time you comment but it’s free). My personal favorite tends to change depending on what I’m working on. For a while my favorite was Miami, because, odd as it is, the front side can tell you a lot of stuff about what’s going on in the sky (it might be worth a separate posting at some point; you can use it to find planets in the sky and even quickly estimate the phase of the moon). But Geneva, because of its zillion complications, will probably always be the one I keep coming back to.